SUMMARY: The City of Cocoa Beach sought a cohesive vision for the commercial properties north of downtown Cocoa Beach. The resulting redevelopment plan, the Gateways Master Plan which was adopted by the City Commission in June 2014, was intended to spark desirable private development that will upgrade the city's primary tourism areas while retaining the character of Cocoa Beach. Spikowski Planning created implementation strategies to revise land development regulations and permit the desired form of future development. Dover, Kohl & Partners was the lead consultant, also assisted by Community Design Associates and EPR, PC. WHAT HAPPENED NEXT: In March 2016 the City Commission updated most of the city's land development code, including the zoning regulations. A final phase then began to complete the update by creating new rules for the uptown area to carry out the recommendations of the Gateways Master Plan. 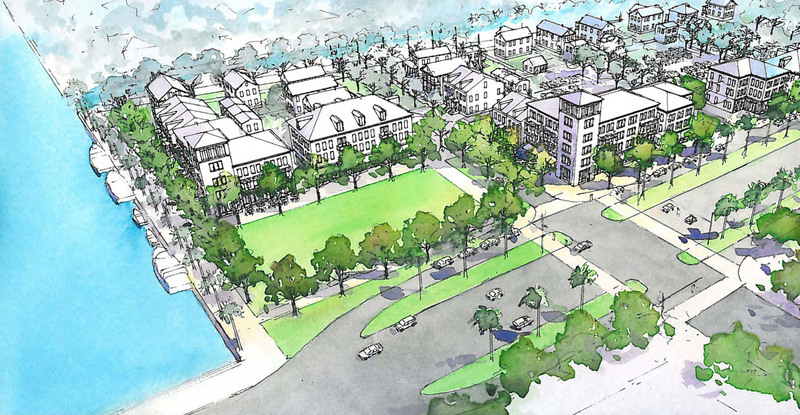 This phase also refines the rules for redevelopment in downtown Cocoa Beach. The new regulations are be presented graphically so that landowners and the general public can understand the intended types and sizes of buildings and streets. All redevelopment will be required to comply with the city's plans, vision, and codes for these areas. A new uptown/downtown zoning district will streamline today's conflicting zoning, land use map, overlays, and design standards. Additional standards will improve how commercial properties along A1A look and function. WINTER-SPRING 2017: The City of Cocoa Beach hosted a workshop about this final phase of the zoning code update in April 2017, which included a presentation by the city's consultants, Dover Kohl & Partners and Spikowski Planning Associates, about their progress on the new code. A complete draft of the May 2017 version of the code can be downloaded here. SPRING-SUMMER 2017: The Planning Board held a series of workshops during the spring and summer of 2017 to consider additional changes to the draft code. In August 2017, the Planning Board gave preliminary approval to the revised code. A complete draft of the August 2017 version of the code can be downloaded here.